¡We wish you full of professional success! On Friday December, 15th 2017 the Hotel-School of Sant Pol de Mar hosted the Graduation Ceremony of the promotions 2016-17, in which the Diploma of completion of the studies was delivered to the students who finished their studies last summer. 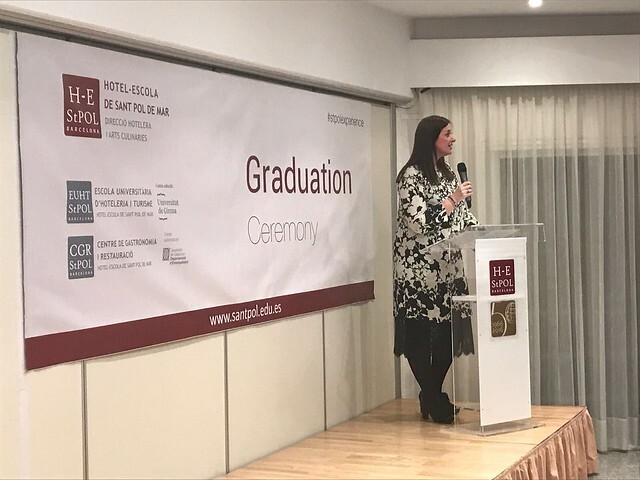 This fifth edition of the Graduation Ceremony began with the welcome speech of the Director of the Hotel-School of Sant Pol de Mar, Lluís Serra, followed by the masterful lesson of Mrs. Brunella Zinato, representing Marriott International. Mrs. Zinato spoke about her experience and professional career in the leader hospitality brand in the world. She also gave them tips for the beginning of their professional career. In her speech, she highlighted that the most important thing to achieve our goals is to work hard, doing a great effort and with a good attitude and, especially without forgetting human values. Vth edition of the Bachelor’s Degree in Hospitality and Tourism Management,In which was also awarded the Extraordinary Diploma of the degree of the University of Girona, for the student Narcís Presas Maestro. XXIVth edition of the Master en Artes Culinarias y Dirección de Cocina. Ist edition of the Master in Culinary Arts and Kitchen Management. From the Hotel School of Sant Pol de Mar we want to wish the students who finish the studies in the school a good start in the professional life and a professional tour full of successes.